An elegant, healthy and timeless dish fit for a Mediterranean emperor. Making roasted Loup de Mer or Branzino will surely make you feel as if you have traveled to Provence, France, or the Amalfi Coast of Italy for a day! This classic combination of fennel with the delicately sweet and flaky Loup de Mer makes for a glorious culinary experience. Enjoy this amazingly delicious dish with a glass of white wine from Santorini Greece, or a Sauvignon Blanc from the Loire Valley of France. 2 Lemons, Sliced 1/4 inch thick, horizontally. 1. Dry the Fish on both sides with a paper towel. 2. Season each side of the fish with salt and pepper. Season the inside as well. 5. 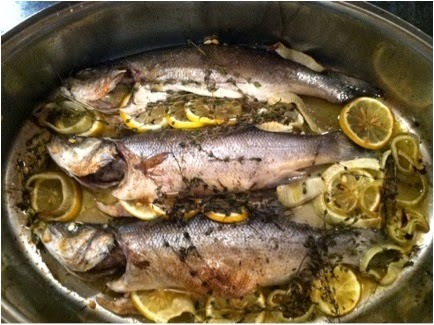 Place the Fish in an oiled Roasting Pan (again, preferably olive oil) and scatter the sliced fennel around the fish. 6. Place Roasting Pan into a 375 degree oven for 30-35 minutes, or until cooked through.